Continuing the Xerox-exclusive tradition of environmentally sound, cartridge-free Solid Ink, the ColorQube 8580 colour printer is a powerful, no-fuss and waste-conscious printing solution that�s simple and highly productive, with the advantage of superior colour output. Environmental Sustainability ColorQube 8580 Environmental Sustainability Your Office, Greener - Less waste, less environmental impact. Packaging for the printer and Solid Ink sticks generates up to 90% less printing waste, lower Life Cycle energy demand and a smaller carbon footprint than comparable laser printers. 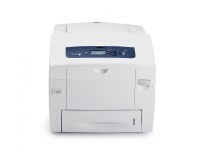 - Earth Smart print driver settings. Easy-to-use print-driver gauge allows you to choose the most environmentally conscious print settings, such as two-sided printing. - Optimize energy usage. Intelligent Ready technology learns your workgroup�s usage patterns and moves to low-power mode when you�re least likely to use it. - Bundled GreenPrint software. Use the standard GreenPrint tool to help you print only the pages you want for reduced paper and ink usage. Colour Performance ColorQube 8580 Color Performance High-Performance Colour - Incredible detail and halftones thanks to 2400 FinePoint� print resolution. - Solid Ink gives your documents rich, vibrant colours on all media, including recycled paper. - Wide media range, including plain paper, labels, envelopes, card stock, business cards and glossy media. - PANTONE� approved solid-colour simulations and Xerox colour correction technology deliver results that always match your expectations. 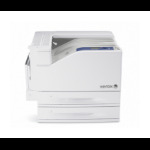 - High monthly duty cycle of up to 85,000 images means you�ll get a reliable colour printer that will last for many years to come. 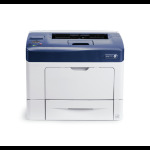 - Print when you�re ready. A first-page-out time as fast as 5 seconds means your print job�s typically ready by the time you walk to the printer. - True Adobe� PostScript� 3� and PCL 5c emulation print languages ensure your jobs are printed accurately every time. - No time lost for colour. The ColorQube 8580 prints black-and-white and colour at the same fast speed. - Intuitive colour correction. The Colour By Words feature lets you select desired colour modifications from a simple drop-down list. 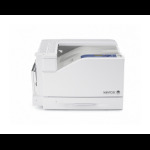 The Right Fit for Any Office ColorQube 8580 The Right Fit for Any Office The Right Fit for Any Office Environment - Easy expandability lets you add memory to enable more time-saving features, as well as paper capacity that�s expandable to 2,200 sheets. - Small footprint. The ColorQube 8580 fits almost anywhere in your work space, whether on your desk or in a central location. - Full compatibility with Windows�, Mac� and Linux� environments. - Save shipping costs and storage space. Compared to toner, Solid Ink�s smaller packaging costs less to ship and is small enough to fit in a desk drawer. - Mopria� certified. Mopria certification simplifies the mobile printing experience for tablets and smartphones to many printing devices, including the ColorQube 8580.